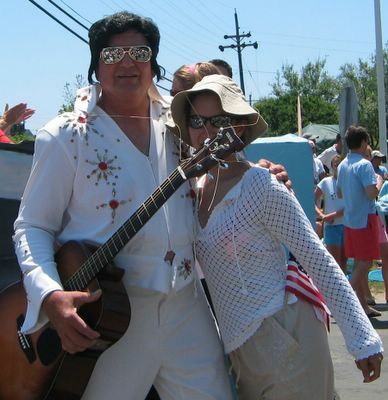 Guess where I went Friday? Yes, Mark Addlebran, the Chef de Cuisine at Morimoto’s was generous enough to assist us with grabbing a reservation. We misspoke in the last entry. Mark, karma is going to reward you! Thanks again! To make it even more amazing, we secured a dining experience at the Omakase bar. Thank goodness my husband bought brand new socks Thursday! The menu was filled with heavenly dishes that each surpassed each other in taste and presentation. But Pantrygirl, isn’t your husband notoriously finicky. How did you get him to go with you? Well, I didn’t have to prod him at all. 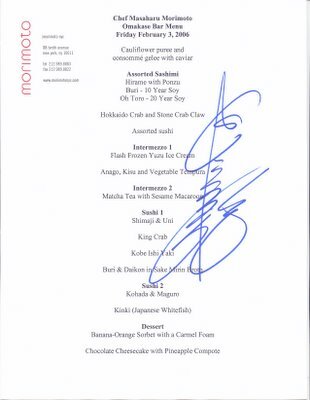 The man was willing to open his mind for Morimoto. “It’s Morimoto. I have to try to be open-minded.” Thanks. Remember that when I make meringue this week. I don’t care if it’s fluffy looking, you’re going to try it. To chronicle our dining experience, I tried futilely to photograph each dish. Unfortunately, my taste buds and stomach won the battle and pictures are not available. Before I could take a bloody photo, my chopsticks were already digging into the delicious dish. By the way, if you want to check out photos of some of Morimoto's dishes, check out Augieland. Thanks go to Augie for his tips and suggestions. 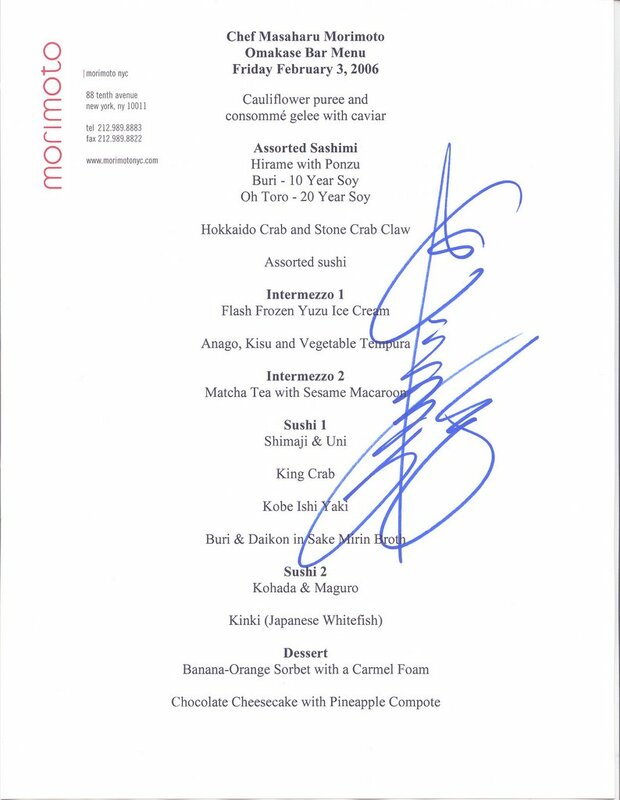 Be on the lookout for more Morimoto entries as he continues his culinary excursions. My husband ate everything, every last morsel of each dish. The only thing he felt wasn’t to his taste was one the last sushi items but he still ate it. I was quite impressed and happy he enjoyed himself. His favorite dish was the very first dish, Cauliflower puree and consommé gelee with caviar. He made the loudest ‘mmm’ sound. I thought I saw a few chefs chuckle. Standouts include the Hokkaido crab and the Buri-Daikon. The Buri-Daikon is comfort food at its best. I defy anyone to enjoy a bowl and tell me the world isn’t a better place. Surprisingly, Lrudlrick felt full before I did. I could have gone on for more courses but my belly and my wallet realized it was time to go. The lounge area was lovely and surprisingly cozy for the minimalist design. The sushi bar and the Omakase bar are definitely the seats to request. There private rooms are in the front of the restaurant and provide a quieter dining experience. Note these rooms are the rooms you see through the windows. If you stop by, feel free to ask any of the staff about the raw bar and the items that frequently change there. The staff has been highly trained on the menu as well as the architectural design. Everyone was extremely personable and willing to share their stories on being one of the chosen to work at Morimoto’s. The ship is oiled and the ballet is pleasant to watch. Some of the chefs came from Morimoto’s Philly restaurant. Others are fresh and eager newbies. The concentration of the masters is thrilling to watch. Jess gave us a tour of the restaurant and told us the lounge’s menu is completely different and worth a try. She also informed us a luncheon menu will probably be offered in the coming months. I guess I know where I’ll find Lrudlrick. If you get a chance, I recommend you go and enjoy. If your experiences with Japanese food comprise of teriyaki or if you hate sushi or even if you are the finickiest eater in your family, go. Try. Enjoy. I promise you’ll leave with belly’s full and a grin on your face. BTW, if you see our menu on Ebay, that’s because someone stole the first one that was written. Stop the World. I Want to Get Off.